Enjoying where you are is the plan of any great vacation. We have information to make your stay so memorable that you will put us on your favorite list of places to go. Stop by the Vacation Rental Office for details of what is going on at Oyhut Bay and all of Ocean Shores. Bicycle Rental: Available by appointment in the off-season, and onsite all Summer long. Kayaks, Paddle/Skim Boards available by appointment in the off-season, and onsite all summer long. 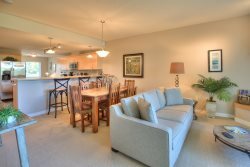 Visit our Real Estate Office at Oyhut Bay and see what is being planned for the Community. Open daily 10 am - to 5 pm. Little Free Library: What's better than curling up with a good book at the beach? Find our bookshelf of books - free to borrow, in the Pelican Post behind the Vacation Rentals office. Want to know what`s going on at Oyhut Bay? Check out all that we have going on!